Of all my years of beauty product testing, I've never come across a STICKY concealer. The best way to describe the texture of this stuff is...well...Almost like sticky tack. It's a sticky, thick concealer, which you would think might do wonders for the staying power, but it isn't at all blendable. Once you finally try to blend it, it disappears into your skin...and is nowhere to be found. 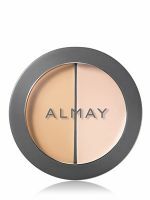 The conc...read moreealer looked promising, and Almay usually isn't the type of brand to fail like this, but I will never purchase this concealer again.